Did you know that making a few simple lifestyle changes, such as exercising, will not only help you live a healthy life, but exercise can extend your life by as much as six years? One study shows how exercising can potentially reduce your risk of dying from heart disease—even if you don’t have the healthiest blood pressure and cholesterol levels. Keep in mind that there are some key exercises that you need to include in your daily routine that could potentially help extend your lifeline—by as much as six years! Going for a jog is a great way to boost your life expectancy. By getting outside or using the treadmill for one hour to two-and-a-half hours per week, you can increase your life expectancy anywhere from 5.5 years to over six years. Jogging is great for your cardiovascular system and can fight high blood pressure, heart disease, and diabetes. If you’re unable to jog, you can always start with a walk at a comfortable pace and increase your speed over time. Your body is pretty resilient and will adapt quickly to progressive challenges! Taking the stairs is another of the best ways to improve your cardiovascular health and extend your life. If you work in an office building or live in an apartment, swapping the escalator or elevator for the staircase can make a big difference in your health and longevity. Taking the stairs can reduce the risk of an early death by 15%. And that number can grow significantly if you do about five flights per day. Doing any kind of workout for at least 15-30 minutes per day can have benefits. New research shows that sedentary people who start exercising for 15 minutes per day can increase their life expectancy by three years. And although just about any form of exercise will be beneficial, I’d like to suggest doing about 10 minutes worth of squats followed by 10 minutes of walking. I generally suggest squats as a tool for longevity for two important reasons: they help build muscle throughout the body; and they greatly improve balance. 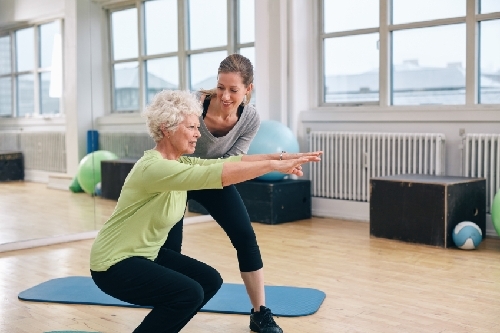 Building muscle for durability and improving balance is extremely important as you age. Finally, since falls are a leading cause of disability and early death among people over the age of 60, strength and balance are the best ways to reduce the risk of injuries.